T3K-Forensics is going to TechCrunch Disrupt SF 2018 (Sept 5-7, San Francisco CA), presenting its innovative analytics solution, based on Artificial Intelligence and Machine Learning. 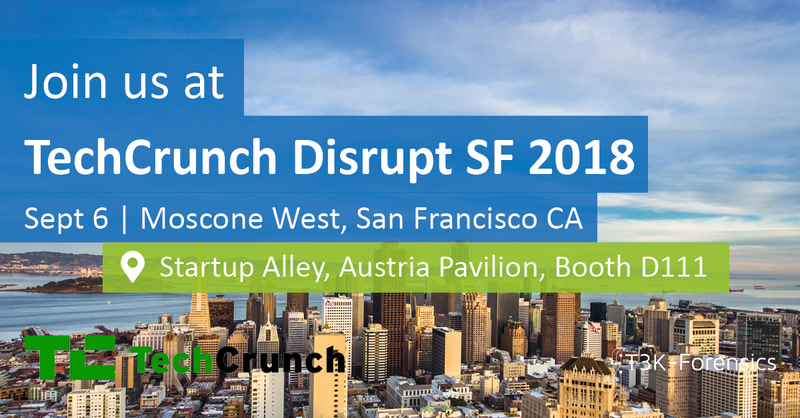 With more than 1,200 exhibitors and sponsors showcasing the latest and greatest tech products, services and platforms, Disrupt SF is one of the most exctiting events for tech startups. T3K-Forensics is exhibiting in the Startup Alley on Thursday, 6 September 2018 at Booth D111 (Austria Pavilion). We are showcasing our highly innovative analytics platform, which analyzes smartphone extractions within a few minutes. T3K-Analytics allows a simple, automated and standardized analysis process of mobile devices, which can also be carried out by non-technical personnel. By means of the process automation, a comprehensive, sampling-type verification can be achieved, for example at airports, within 30 minutes. Are you interested? Contact us to schedule a meeting to learn more about how our platform can help investigators in their daily mobile forensics work!